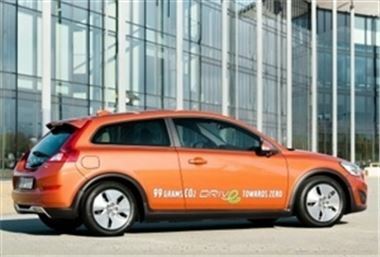 Eco-conscious drivers thinking of buying a new car could be tempted by the new Volvo C30 1.6D DRIVe. The latest offering from the Swedish manufacturer has seen off stiff competition to scoop this year's Green Car of the Year award, as voted for by TheGreenCareWebsite.co.uk. The judging panel were particularly impressed by the C30's fuel efficiency, with its rate of emissions of 99 grams of carbon dioxide per kilometre helping it to come above the Toyota Prius in the green motoring league. Furthermore, the fuel consumption rate of 74.3mpg, as well as the fact that Volvo has not compromised on style or comfort, makes the model "a deserved winner" and a smart choice for consumers buying a used car and looking to keep costs and their environmental footprint at a minimum. Welcoming the news, Peter Rask, managing director for Volvo Car UK, said: "Volvo Cars' vision is to develop cars that are entirely free from harmful exhaust emissions and environment-impacting carbon dioxide. "Emitting only 99g/km of CO2 the Volvo C30 1.6D DRIVe with Start/Stop shows how Volvo are well on their way to achieving this vision." Meanwhile, new figures from the Society of Motor Manufacturers suggest that Volvo is on track to become the first premium brand to sell more cars in the UK in 2009 than it did in 2008.